Middle East Film and Comic Con 2016 gets set for its 5th Anniversary! The Middle East Film and Comic Con , the definitive pop culture convention in the Middle East is back and is all grown up! 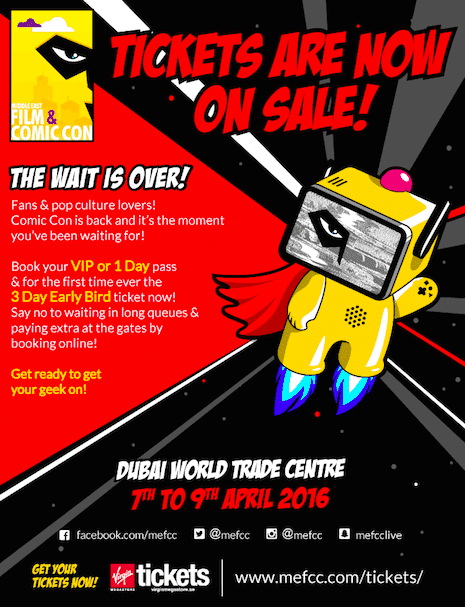 With tickets on sale now, MEFCC 2016 takes another step forward, showcasing an eclectic and fun-filled lineup of content from 7th to 9th April 2016 at the Dubai World Trade Centre (DWTC) featuring the best regional & international talent, celebrity guests and more for some of the best fans in the world! Proud to be celebrating its 5th year after winning the coveted ‘Best Exhibition’ Award at 2015’s Middle East Event Awards, MEFCC looks to continue its impressive track record of success. Christopher Lloyd. This award-winning actor is best known and loved for his roles as Emmett “Doc” Brown in the Back to the Future trilogy, alongside many other quirky roles over an amazing career! Amine lovers (or anyone who was a child in the 90’s!) are also in for a treat as Veronica Taylor, the veteran voice actor behind Pokémon’s main character Ash Ketchum, will be in attendance. For eight seasons Veronica provided the English language dubbing for Ash in addition to the voice of April O’Neil in the iconic Teenage Mutant Ninja Turtles series. Finally, in the initial announcement of guests, is the attendance of Fabian Nicieza who comic’s fans will know as the co-creator of Deadpool, now a world-wide mega hit film breaking all previous box-office records and starring Ryan Reynolds. Fabian will be signing and talking to fans about how he came up with one of the craziest characters in Pop Culture.